In this conference the new EBE Concept paper on management of raw materials for biologicals will be introduced and discussed. Raw materials (RM) used in the manufacture of biological medicinal products need to be well understood with respect to their role in the manufacturing process. In particular in a GMP regulated environment these raw materials, components as well as excipients require a thorough control regarding consistent quality. Therefore all critical quality attributes should be known and appropriate risk mitigation and control strategies should be established. 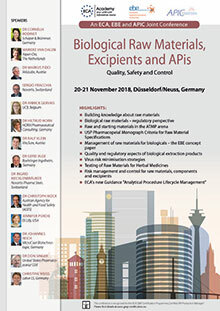 As there are currently no written industry guidelines available dedicated to a risk-based biological raw materials management approach the European Pharmaceutical Enterprises, EBE, has developed a concept paper entitled “Management and Control of Raw Materials Used in the Manufacture of Biological Medicinal Products“ in which the principles of such a risk based approach is outlined. Click on the picture to download the complete Programme 2018 as PDF. Conference participants will also have to opportunity to visit the PharmaLab exhibition taking place at the same time. Over 30 exhibitors will inform you about the newest developments in analytics, bioanalysis and microbiology as well as related services.